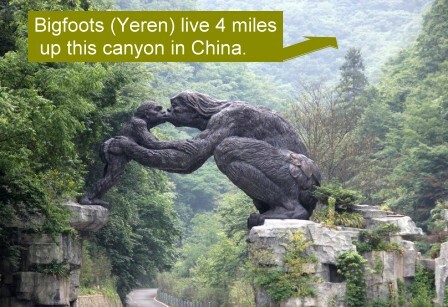 In China a bigfoot is called a "Yeren" [anglicized plural: Yerens]. Not far away in Nepal the same type of animal is called "Yeti." In Mongolia a bigfoot is called "Alma." Vietnam a bigfoot is called "Tah-ree." They may be slightly different species but their similar footprint shapes and overall appearance and behavior and habitat choices indicate a close relationship among all of them. If you're wondering how mysterious ape-men could live in the most populated country in the world without bumping into humans every day, consider that most of China is fairly unpopulated. Indeed, 90% of China's population lives near the coast or in the bright green lowland zones shown in the map above. Almost everywhere else outside the light green and dark green zones is sparsely populated, especially the mountain ranges. For centuries Yerens have been reported in a few separate mountain ranges in China. 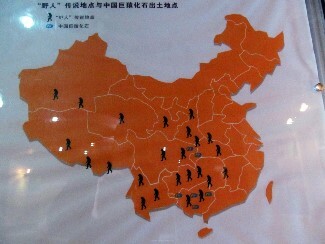 See the map below indicating sighting locations and track finds across China. This map hangs on the wall of the offical Wildman (Bigfoot) Museum in China. All of those locations indicated on the map correspond to relatively unpopulated mountainous areas. Click the map image below to see it more closely. Yerens are most famously associated with the highlands of the Daba Mountains. The highlands of the Daba Mountains is called "Shennongjia" (pronounced "SHEN-NONG-JI-A"). It means "Shennong's ladder". See the multi-color map above to see the location of Shennongjia with respect to the major cities in China. The rich flora and fauna of Shennongjia were preserved from human destruction over the millenia because of the steep rocky terrain. Up until the past few decades it was nearly impossible for anyone in the lowlands to hike so far back into these particular mountains. The only people who could do it were plant experts like Shennong who knew which plants and herbs could be eaten along the way. It was simply impossible to carry enough food for the whole journey. On foot it would have taken weeks in each direction. When you hike off trail in the Daba Mountains you appreciate the cleverness of Shennong's bamboo ladder. A light weight bamboo ladder would have allowed Shennong to go further back into the mountains than any of his contemporaries. His ladder and his knowledge of plants guaranteed that he wouldn't starve if he stayed out there for a long time. There are dozens of species of mammals in Shennongjia and even more species of birds, reptiles and insects. However, it is the extraordinary biodiversity of plants that makes Shenongjia famous among ecologists. There are 3,500+ different species of plants. 2,000+ of those plants are rare herbs. Dozens more plant/herb species are discovered every time a qualified botanical expedition explores these mountains. That staggering amount of plant species demonstrates two important facts about Shennongjia: 1) It was a lifeboat for many ancient Asian life forms that did not survive the last ice age anywhere else. 2) It is virgin forest, never stripped or altered substantially by humans because the steep terrain made it physically inaccessible until the modern era when it became protected by law. Thousands of rare species survived the last ice age because the Daba Mountain range protrudes like a penninsula into the warm humid air of the lowland plains (refer to multi-color map above). The continuous warm humid air flowing around the tip of the pier protected it from the advance of the ice sheet. The warm air flows dampen any extremes of tempertature. Shennongjia never experiences intense heat in summer or intense cold in winter. The highest peak is just short of 10,000 feet. That's too low for the formation of glaciers but it's high enough to stay pleasantly cool in summer and spring when the lowlands broil in sticky heat. That sticky heat of the lowlands flows into the valleys of the Daba Mountains. It pushes animals like the Yeren up into the coldest highlands to escape it. That's why Yerens don't have better options for most of the year, and why they are basically guaranteed to keep coming back to Shennongjia every year: It's the coolest place in central China. The big obstacle to a Chinese-led research effort aimed at Yerens has been uncertainty about where to focus. There is a methodology to address that uncertainty. 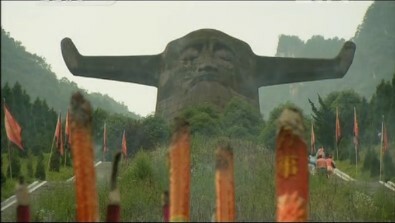 The BFRO started the process in Shennongjia in 2013 during the taping of an episode of "Finding Bigfoot." All available info was collected about sighting locations, especially those areas where the reports were clustered. 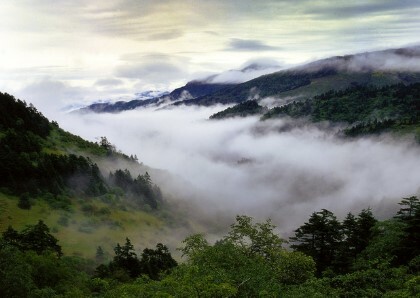 Many of those areas were in the Shennongjia Forest District but outside the Shennongjia Nature Reserve. The nature reserve comprises roughtly a quarter of the forest district but the forest district is very large -- larger than the state of Rhode Island. The local Chinese forestry offiicals were very, very cooperative with us and they already knew some areas where there had been several incidents in recent years. A few of those areas were probed at night by the American bigfoot researchers. In one of those areas some bigfoot-like vocalizations were heard across a canyon and a possible encounter occurred when a large unseen animal fled from the group. The animal crashed through the trees loudly while fleeing down a nearly vertical slope. The sizes of the branches snapping indicated an animal in the weight range of a human -- not a monkey. Earlier in that evening the local drivers/porters described hearing something large stalking in the brush nearby as darkness began to fall in the canyon. They were parked at the end of the paved road, one mile up from the barricaded point where vehicles are not allowed to pass without special permission. You need special permission because the Chinese government believes Yerens live in this area and they are probably correct about that. There was a noticeable thermocline in the same area where the 2013 incidents occurred. A thermocline is a boundary between different temperature zones. In Shennogjia warm humid air from the open lowlands pushes up into the mountain canyons and collides with the cold air sliding down off the highest ridges. You can feel the thermocline when you're standing in it for a while. You feel waves of humid air rushing up the mountain slope. Moments later a cold breeze blows past you going downhill. The two air masses mix and produce a drizzly mist similar to heavy coastal fog. The temperature boundary was noticeable around the 5700 foot elevation on the night in question. It probably shifts up and down the slope depending on regional air temperatures but for spring and summer it will be somewhere between 5400 ft and 6100 ft.
Those rough parameters are noticeable because the continuous fog and drizzle has a noticeable effect on plant growth, just as it does along the Pacific Northwest coastline. The fog drizzle collects on trees and drips continously like in a rainforest. All the plants and trees are bigger and greener. More animal and bird sounds can be heard as well. 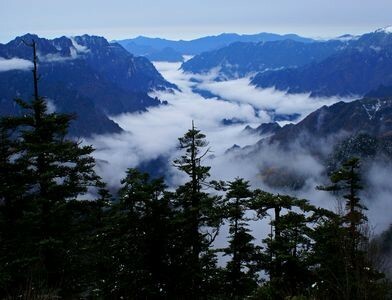 This is the altitudinal zone where plants, animals, birds, reptiles and insects are most concentrated in Shennongjia. If you hike around in the thermocline zone at night you'll notice you can use it to adjust your body temperature. If you're too warm you walk uphill a bit. If you're cold you walk downhill. That convenience and comfort is another big incentive for all sorts of creatures to remain near the thermocline. The Google Earth animation at the top of this page shows the thermocline zone where the sounds and encounters occurred when the Finding Bigfoot team was allowed into the area in 2013. It shows the thermocline zone inside the three canyons where some Yerens will likely spend most of their time in spring and summer. This article describes a specific area where Chinese bigfoots will likely be in late Spring and Summer for many years to come. For background information on this area, called Shennongjia (Shen-nong-jia), watch the most recent documentary by Central China Television. The BFRO encourages any western bigfooters or wildlife photographers to visit this area. You'll be a hero in China if you get photos or sound recordings of their bigfoots. Most Chinese people, especially locals in this area, cannot afford the type of camera/audio gear that western bigfoot researchers typically possess. Do not assume that it is expensive to travel to China. A roundtrip ticket from San Francisco all the way to Shennongjia costs only $1,200 -- not much more than a roundtrip flight to Paris. Everything is cheaper once you get there. China is very safe and very civilized and still very inexpensive outside the big cities. The extraordinary mountain ranges of central China are the country's best kept secret, and there's no air pollution up there. It is like the American Rockies in terms of its separation from smog problems in the big cities. If you decide to go there on your own please contact us at ContactUs@BFRO.net so we can keep in touch. Click the image below to see the most recent documentary about Shennongjia. Click the image above to watch the best and most recent documentary about Shennongjia. It was produced in 2012 by CCTV (China Central Televison - official). This documentary talks about snake research but it covers the Chinese Bigfoot (Yeren) research also. Is it safe to tell the whole world about this special hotspot? The bigfoot hotspot described in this article is deep inside a large and well-protected nature reserve that requires permission to enter. The Chinese government clearly believes Yerens exist in this reserve. They want people to know it and they are prepared to protect them. Even the most determined big-game hunter wouldn't be able to arrange a hunting trip there. China is very, very different from Africa in that regard. If you're going to China to hunt any kind of animal you won't get very far before you're in a world of trouble. But if you're there to photograph their wildlife you'll be permitted and even assisted. The audio and video/optical equipment commonly owned and used by bigfoot researchers in the West is out of reach of the vast majority of Chinese people. Moreover, there are almost no Yeren field researchers in China comparable to the subculture of bigfoot researchers in the West. The irony is that governments in the West deny the existence of these types of animals but in China they are not denied by the government at all. On the contrary. 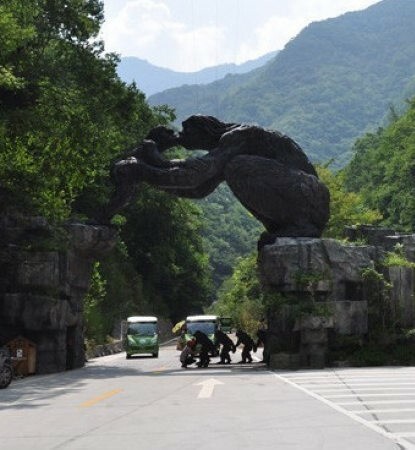 This enormous statue of a mother Yeren and her baby towers over the entrance to a special area within the Shennongjia National Nature Reserve where Yerens are believed to reside. The hotspot pinpointed by the BFRO in 2013 is four miles beyond this statue. The smaller Yeren figures on the road below the statue are part of the gate that blocks the entrance at closing time. Serious looking soldiers with machine guns stand watch at this gate all night long to make sure no poachers sneak into this area. Bright strobe lights flash at your car as you drive near the entrance, even if you don't drive through the gate. Every vehicle gets photographed. The area is well protected from mischief makers which is why the BFRO can be so specific about where Yerens are likely to be found. There have been over 400 documented sightings of Yerens in central China over the past century. Footprints have been found and cast. Hairs have been found and studied, but no bodies, bones, etc. The Chinese have no more evidence than scientists in North America, and even less annecdotal evidence, but the collective picture brings leaders on every level of Chinese society to the sensible conclusion that Yerens do exist. There was a tipping point incident several years ago in China that changed governmental attitudes about the Yeren. A journalist from Wuhan along with a local politician and some forestry scientists/supervisors were all riding in a car together near the top of the highlands. At close range and broad daylight they watched a Yeren cross the road in front of their vehicle and bound down a steep slope. These witnesses were all respected guys and were taken very, very seriously by the Chinese government. No one would suggest their sighting occurred only in their imaginations or that they mistook some other animal for a Yeren, no, not with so many important people and not under those circumstances. It's important to note this tipping point in China because nothing comparable has happened in Canada or America. There hasn't been a multi-witness incident involving a group of well respected observers from the media, government and science, who simultaneously had a sighting at close range and in broad daylight. Things might be different here otherwise. No one has even tried to record Yeren sounds !! There are many areas in the West where a bigfoot researcher can get sound recordings of bigfoots at night. There's a growing collection of those recordings now because they are so much easier to obtain than photos or videos of bigfoots. No one has even tried to get sound recordings of Yerens in the reserve. The equipment required is simply too expensive for the vast majority of Chinese but not for Americans. Scientists and government officials won't automatically dismiss recorded evidence like their counterparts routinely do in the West. In many ways the government's position on the subject is a preview for the way things will be eventually in America and Canada. See the Chinese documentary below. You won't understand what the witnesses are saying unless you speak Chinese but you'll see they take the subject seriously. No modern reports describe aggressive behavior of Yerens. They run from humans. The only real threats to humans in Shennongjia are poisonous snakes. There are 23 different species of snakes in Shennongia but only a few are poisonous. Like the Yeren, snakes will flee from humans. Basic rattlesnake precautions should keep you safe because the poisonous snakes are on the ground. They don't hang from trees where they can bite you in the face as you walk along the trail, like in the Amazon. 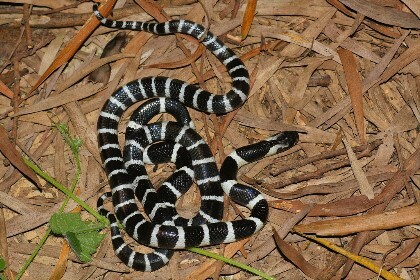 The most feared venomous snake in Shennonjia is the Banded Krait (Bungarus multicinctus). Kraits are found in marshy areas in many parts of Asia. Snake experts say a krait is basically a cobra without the hood. They are mild-mannered snakes but don't try to take a selfie with one. The mortality rate from a bite is particularly high. Bigfoots in North America eat snakes, among other things, so it is likely that Yerens eat snakes also, especially in Shennongjia where snakes are so plentiful and easy to find. Non-venomous snakes could easily be the staple protein source for Yeren. There are ungulates like deer in Shennongjia too but they are rare compared to deer in North America. There's simply more snake meat available in Shennongjia than any other kind of meat. That being said, it would be wise for a photographer to stakeout a spot in the thermocline zone wherein snakes are especially plentiful. The main creek is one choice. The downside to that option is water noise. The sound of water loudly cascading down the creek severely limits your ability to hear something approaching or to hear distant vocalizations of Yeren. A preferable position would be a distance from the creek but with a view of the creek. 1) Photo/video camera. If you don't have one yet then definitely buy the Nikon coolpix P900 - $600. It's like having telescope attached to a SLR. Shennongjia is a rainy place. Rain can ruin electronic equipment. The trail camera and GoPro are rainproof but the other items are not. For those other items you will need to make your own rain jackets with ziplock bags and rubber bands. The mics of the sound recorder won't be damaged from moist air but they will loose a bit of sensitivity permanently if they ever get soaked in rain. To prevent that the sound recorder needs to be upside down inside a ziplock bag with the openning pointed toward the ground. It should have a strap attached to it can hang from a tree branch that way. Test all of your rain coverings before you travel and bring additional ziplock bags. No one has made a serious effort, over several nights, to record the sounds of Yeren, mainly because the equipment cost is not affordable to most people in China especially the folks who live in that area.